•	Perform bill pay, toll payments, Refuse recycling payments, etc. Leaders Enterprise Ltd. is continuously striving to be at the forefront of bringing leading edge technology solutions to the retail market in Ireland. We have spent two years researching the leading vendors of Self-Checkout Globally. Self-Checkout is a Business Transformation Project. It’s not about the Technology. It’s about the Application of Technology. Choose a Partner Who Can Help! Providing Business Process and Best Practice Guidance. In the last two years we have worked very closely with NCR to develop a seamless integration between our SAMforWin™ POS application and their SelfServ Checkout (SSCO) solution. SAMforWin™ back office system does not require the user to possess any computer skills or experience. •	Very easy to use and operate. •	Run it from anywhere in the world on your Tablet or mobile device. •	Developed by retailers for retailers. •	Guaranteed Irish: It is developed, maintained and supported in Ireland. •	Built-in Crystal Report Writer® engine to produce reports and reports generator. •	Utilises the latest Touch Screen technology for ease of use and effortless operation. •	Utilises MS SQL® database, the most popular database format on the market. •	Runs on MS Windows a stable fast platform. Create your own reports (Select columns, include/exclude categories and modify report fonts & colours) and save template to be reused later •	Comparison reports: Compare sales & purchase performances between any two periods. (1) Any type of Server failure. (2) One or more Checkouts failure. 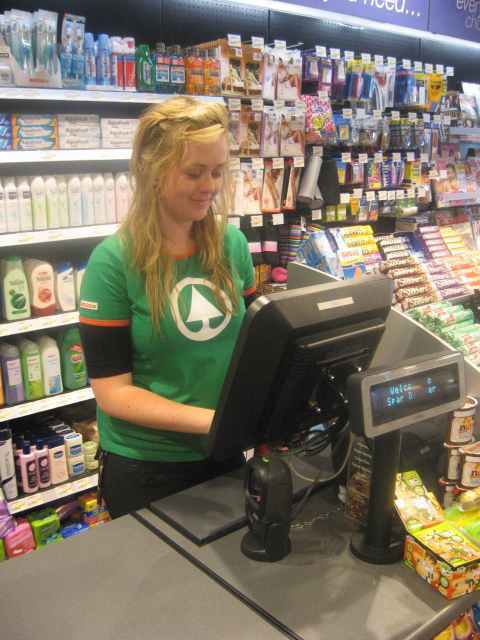 The SAMforWin™ system has proven to play a vital role in the technology of retail businesses over many years and is successfully used by thousands of people in Ireland every day. All the components are seamlessly integrated to provide one stop shop solution to any progressive Forecourt retailer. 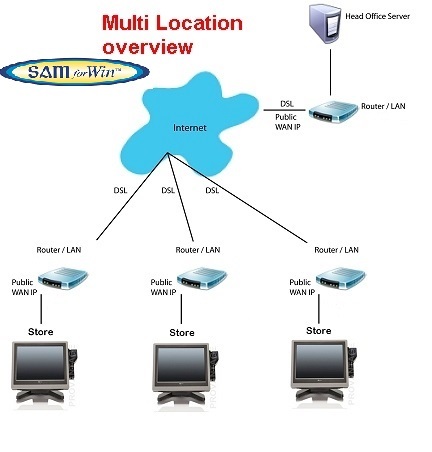 SAMforWin™ MULTI LOCATION module diagram. The branches can be located in different countries using different currencies. Data are updated live between the branches and Head Office. This module also makes ordering and stock replenishment processes easy and efficient. SAMforWin™ seamlessly integrates with other third party solutions. 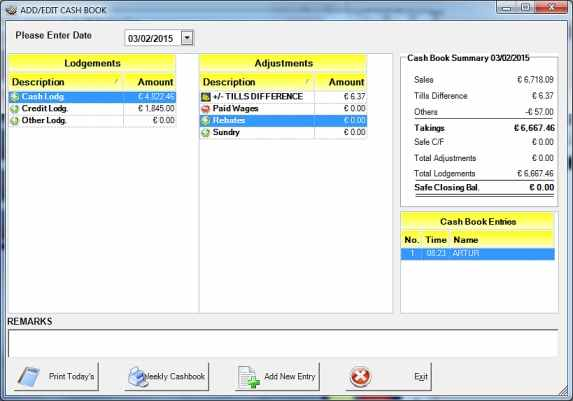 The above screen shot shows how easy the user can post Cashbook entries to SAGE accounting package. Progressive fully touch screen front-end module that seamlessly integrates with loyalty systems, credit/debit cards, contactless payment, acquiring mobile top-ups, tobacco vending machines, weighing scales and more. Working with the world's number one supplier of Self-Checkout, NCR, this solution is now being offered to small retailers with individual retail outlets. 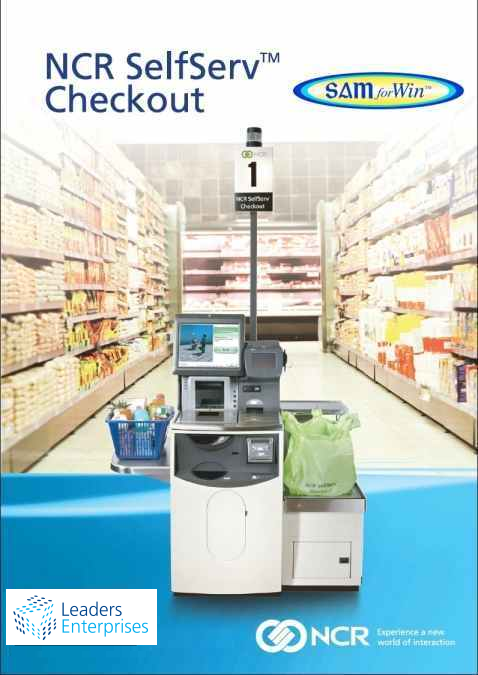 For the first time in Ireland and the UK you no longer have to be a large symbol group to install Self-Checkout. A very user-friendly Retail Management and Stock Control Back Office system that utilises graphs and detailed reports on margins, sales, stock valuation, gift vouchers and user-defined memorised reports. The system also facilitates automated suggested orders, electronic ordering, stock usage and a multitude of other features. 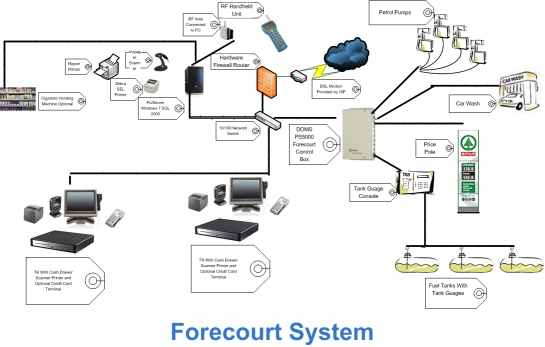 This module gives you full control of the forecourt from the tills and Back Office. It also provides control fuelling authorisation, pre-pay and tank reconciliation amongst many other features. The forecourt module produces ROM1 (Revenue Oil Movement) monthly reports for the Revenue. This module allows the Head Office to control and report on multi location branches by utilising a simple user-friendly suite of programs. The branches can be located in different countries using different currencies. Data is updated live between the branches and Head Office. 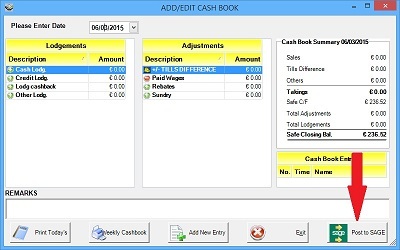 This module also makes ordering and stock replenishment processes easy and efficient. SAMforWin™ seamlessly integrates with other third party solutions, such as SAGE accounting system, PayBack Loyalty system, CCTV alert system, Payzone bill pay & mobile top-ups. Full food service solution seamlessly integrated with SAMforWin™ system. Includes Kitchen Management Screens and kitchen orders printing. Customer facing ordering kiosks with a very user friendly Graphics Interface. Ordering through mobile application. Full suite of reporting/graphs. At Leaders, we pride ourselves on delivering complete and professional solutions to our customers, and have done since 1991. Leaders deliver full retail systems including initial set-up, hardware & software, installations, Assistance in products file set-up, staff & management training, and after-sales support & maintenance. Leaders also supply and install the award winning SAMforWin™ software system on your existing EPOS hardware and Back Office system. We provide full system on-site and off-site training to both new and existing clients. Our expert trainers are available to provide training for as long as clients require, in order to feel that they have mastered the use of our system. Leaders provide hot-line help-desk software support from 7am to midnight and hardware maintenance with a guaranteed response time of 4 hours from 9am to 5:30pm, 7 days a week. Leaders can provide a project manager to oversee your new I.T. projects and manage the retail system roll-out to all your branches world-wide. Leaders software development department can deliver bespoke add-on software modules to your specific needs as they arise. We are constantly striving to improve our software so that it offers maximum benefit to all clients. Being situated in West Kerry makes no difference to Leaders' service levels, their backup is second to none. 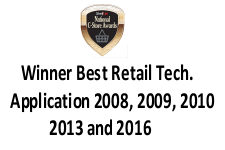 I installed NCR Self-Checkout in Eurospar Barrow Street in October 2014. My customers took to them immediately with children showing parents how to use them! Customers embraced them instantly and in higher numbers than we predicted. I am now installing self-checkouts in Eurospar Bath Avenue as I believe this is the way forward. Like my customers, I am keen to embrace new technology. It helps me run my business more effectively and makes my customers lives easier. Providing a better service to my customers is directly connected to how I run my business. The easier it is for my team to run the shop, the more we can be out there helping people from our local community when they visit us. Efficient front of store and back office systems can save time and improve my bottom line. I have been a customer of Leaders since 2000 and have grown considerably since we opened our first ‘Fresh’ store in Smithfield in 2005. We installed the SAMforWin™ Multi-Location module in 2011. Having 5 stores at that time we needed to centralise our operations with 5 store managers spending a number of hours each day managing product information and pricing. By putting in a centralised solution, we were able to get centralised sales reporting, branch comparisons, standardised categorisation across the group and have one person managing that role much more effectively. We have tighter control of our margins and mistakes in the shop files are spotted and corrected before they impact on our bottom line. Installing Multi-Location with Leaders was the best business decision I ever made. © 2015 Leaders Enterprises Ltd. All Rights Reserved.